Menerbes is the village where Peter Mayle wrote his much-loved book A Year in Provence and its sequels. It runs along the top of a high and narrow ridge, dropping to valleys of vines and orchards on each side. Throughout its history Menerbes has attracted more than its fair share of noblemen and more recently of artists – giving it a distinctly cultured character. 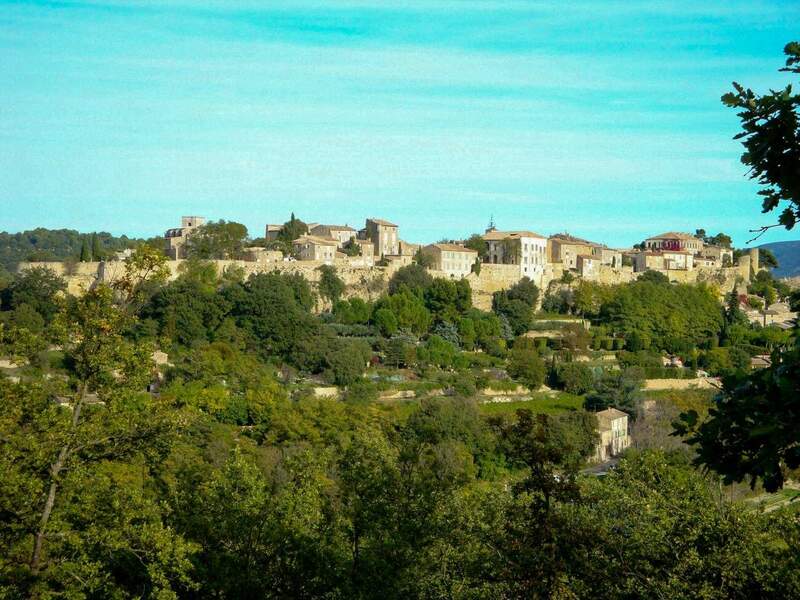 The village is ‘topped and tailed’ by fortifications – the imposing tower of La Citadelle at one end and the medieval castle Le Castellet at the other. Menerbes has two small groceries and a bakery, a seasonal market (Thursday mornings), some good restaurants and a bar, as well as a pharmacy and post office. The Maison de la Truffe et du Vin in the main square by the mairie sells fresh truffles in season and truffle products the rest of the year. The Maison also showcases the local wines and holds tastings. It has a beautiful garden with a gorgeous view of course, and even a restaurant with truffle-themed dishes. The Corkscrew Museum is an eccentric collection of 1200 corkscrews from the downright daft to the historic, and can be found at the Domaine de la Citadelle winery just outside the village on the road to Oppede. Do you know what a helixophile is? It’s a corkscrew collector – there are 1200 corkscrews in the Musee du Tire-Bouchon – which translates as the Museum of the Pull-Cork! The Luberon Music Festival (Les Musicales du Luberon) is based in Menerbes and many of the concerts are held in Menerbes’s Saint Luc Church. This classical music festival runs from June to August and there are also occasional concerts throughout the year. This is a serious affair with artists brought in from across Europe and music spanning baroque to romantic. A wonderful opportunity to listen to music in beautiful and intimate surroundings. Two surprising finds discretely tucked away: Above the ice-cream parlour Maison de Marie is a small boutique stocking stylish European brands for women. For those with deeper pockets cross the road and at the back of Sasha Decoration Mode are women’s clothes from mid-range brands such as 120%Lin and Nougat to high-end names Valentino, Eres, Tods and See by Chloe. The village’s early name comes from the Roman goddess Minerva before morphing in to Menerba and Minerbium and finally settling on Menerbes. The last remaining megalith from the neolithic period (around 4800BC) is here. Inside the Dolmen de la Pitchoune human skeletal remains, teeth, pottery and flint arrows have been found. From the village take the D3 towards Bonnieux for about 1km. It’s on the left under a tiny bridge and even though it’s signposted you’ll need to keep your eyes open! The village makes it into the history books on account of the Siege of Menerbes. During the religious wars of the 16th Century, Protestants took control of Menerbes whilst it belonged to Papal territory, holding fast for 5 years despite prolonged and sustained attacks. Menerbes has some very elegant buildings, built by some presumably very elegant people: the Hotel de Tingry (Count Rantzau of Denmark), the Hotel D’Astier de Montfaucon (by the family of the same name, now the Maison de la Truffe et du Vin), La Carmejane (General Charles-Joseph Carmejane, Baron de Pierredon), and what is now the Dora Maar House (built by General Robert, Baron d’Empire). All except the Maison de la Truffe et du Vin are still private houses. Note: A ‘Hotel’ is not always a hotel, it can also mean a grand house. The 16th Century Church of Saint Luc is now under the care of the World Monuments Fund. The atmospheric cemetery next to the church overlooks Le Castellet, though the key to the cemetery can only be obtained by special request at the mairie. The Abbey Saint Hilaire is a former convent built by Carmelites returning from Palestine in the 13th century. In the 1960s it was bought by the family that restored it and still owns it today. The abbey, now a Historic Monument, can be visited from Easter to November. Menerbes has attracted artists more than any other village in the Luberon. Most famous is Picasso’s muse Dora Maar (1907-1997), a photographer and artist in her own right. Picasso bought her a house in the village in 1944 and she lived between Paris and Provence until she died. Today the house is used by a residential programme for artists. Nicolas de Staël (1914-1955) moved to Le Castellet, a small medieval castle at one end of Menerbes in 1953. His work shifts between abstract and figurative and he was hugely influential in post-war Europe. His life was punctuated by tragedy and he took his own life at just 41. Le Castellet is private and still with the de Staël family. Kentucky artist Joe Downing (1925-2007) came to Menerbes having served in Europe during WWII. Once settled he invited fellow American painter Jane Eakin (1919-2002) to visit. She ended up staying for 40 years and now her house and studio are available to visit from March to November. Cafe Veranda is hitting the high notes and serves consistently good food (modern French). The dining room is modern and warm, and at the far end tables have a great view over the valley. There is also a patio dining area across the street. Veranda is popular with locals and is often full, so book if you’re here in high season. Lunch menu from 16€ and dinner from 35€. About a mile outside the village on the D3 to Bonnieux, Bastide de Marie is a luxury boutique hotel with restaurant. The outside setting is magical, on a terrace with a canopy of trees, in a sea of vineyards, quite stunning. The vineyards produce the wine of the Bastide. The restaurant is calm and elegant, service reassuringly correct. Typical dishes might be squid stuffed with ratatouille, grilled sole with Swiss chard gratin. The chef only uses seasonal ingredients, sourced from the markets. For fine dining, expect to pay around 50€ a head for lunch before drinks. You must book well ahead as there are limited tables for non-guests. An off-shoot of Cafe Veranda, Le 5 occupies the great outdoor space once taken up by Clementine, if you know your Menerbes. This is a lovely gravelled area with mature trees and delightful view to the north. There is no inside, all tables are outside so it is only open May-September. There is also sofa lounging if you just want a drink. The restaurant is an open-air affair and the relaxed atmosphere that comes from such a picturesque setting is really what you come here for. The food is regular bistro fare, perfectly good but nothing extraordinary. The service is warm and friendly. Menerbes is peaceful without being lost in time and in high season art exhibitions and the music festival give it a gentle buzz. Aesthetically, it’s a masterpiece of a village, there is not one ugly stone in Menerbes. For a small village, you have quite a selection of restaurants. Menerbes has a plenty of car parking on its north-eastern side. Approaching from the D3 turn right at the crossroads with the Route de Lacoste, and use the village car park or the street, right at the start of the village centre.